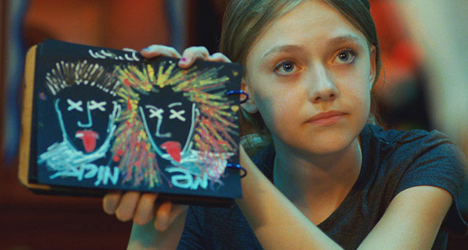 Arguably the most talented child actor to come out of Tinseltown since Shirley Temple, Fanning, 12, has shared screen time with a number of A-listers, including Sean Penn, Denzel Washington, Glenn Close, Robert DeNiro, and Tom Cruise, in her six-year career. 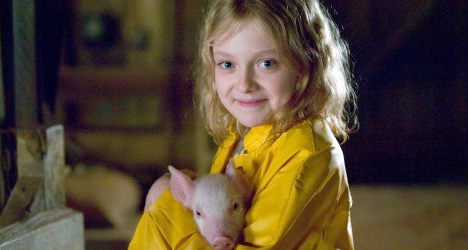 In her new film, Charlotte’s Web, adapted from E.B. White’s 1952 classic tale, Fanning plays Fern, a young farmgirl who saves a runt piglet she later names Wilbur from an early barnyard exit. During an interview with me phone, Fanning talks about working with animals on the set in Australia, being referred to as a child star, and making a small change in her diet to eliminate the possibility of consuming one of her co-stars. When was the first time you read E.B. White’s Charlotte’s Web? I have always loved this book for so long, ever since I was very young. I’ve read it many, many times. Getting to play such a character that everyone knows and loves in a book that everyone knows and loves is so special and an unbelievable opportunity for me. What do you think it is about the book that has made it such a classic story for so many generations? There are so many things that people can learn from the book, adults and children. Getting those messages across in a fun way is very important and really neat. It’s almost like you are educating someone, in a cool way. What kinds of life lessons do you want other kids to get out of Charlotte’s Web? There are so many: Live your life to the fullest every day; be a loyal friend; keep your promises to people. The film teaches us that everyone can change. Even Templeton the Rat, who isn’t the greatest, he helps out and changes, in a way, through Charlotte. So, I’m sure you were able to see the 1973 animated film before going into this project. What did you think about that version? Yeah, I have. [The 2006 version] is different from that one just because I think that one was a little different than the book was. This one is more true to the book. But I am a big fan of the animated one as well. Now, I know you were able to work with horses in Dreamer: Inspired by a True Story last year, but here we have a whole bunch of different farm animals. What was the experience like around all these types of animals, especially on a movie set? I really enjoyed working with all the animals. We had about 70 pigs that played Wilbur. We had cows and horses and geese and sheep. There were just so many animals! It was very exciting to get to work with them and learn about them and see them every day. Did you get attached to any of the little pigs? Well, there were so many of them. I worked with all of them at some point. It was sad when it was over, but we gave them all good homes in Australia, where we filmed this movie. The families that took them in promised that they would stay alive and would never eat them. This film must’ve discouraged you from ever eating bacon again. Yeah, it’s sad. I worked with [the pigs] for so long, they became like friends. So, I don’t think I can [eat bacon] for a long time. I do. I have a Palomino Quarter Horse named Goldie [a gift from actor Kurt Russell] and I have a Schnoodle [a cross between a Schnauzer and a Poodle] named Llewellyn. Talk to me about working on a film in a country like Australia. Australia is interesting because it’s different from America, but very similar. It was exciting to get to go and see kangaroos and koalas. I enjoyed filming the movie there because there were a lot of green, rolling hills. We had all the seasons, so it was nice. You’re 12 years old now and have done a lot of work in this industry. Are you comfortable when people refer to you as a child star or are you ready to get rid of that label? I don’t really mind what anybody calls me. I am just happy doing what I love to do. I do think that anybody can be an actress, no matter your age. Do you think you’re missing out on anything as a kid because of the career path you’ve chosen? No, not at all. I can’t imagine my life without me being able to be an actress. If I had the choice of not to be an actress, I would never choose that. I don’t think [my life] would be as fulfilling as it is right now, and I wouldn’t wish it any other way.